Naturally, before either of these systems can conduct missions, extensive testing needs to be conducted to ensure they are safe and will perform well. In this spirit, NASA Advanced Supercomputing (NAS) research scientists are currently conducting highly-detailed simulations and visualizations to ensure that the Orion spacecraft’s Launch Abort Vehicle (LAV) will keep crews safe, should an emergency occur during takeoff. Basically, the LAV is the combined configuration of the Orion Launch Abort System (LAS) and crew module, and is designed to get the crew to safety if an emergency occurs on the launch pad or during the first two minutes of flight. 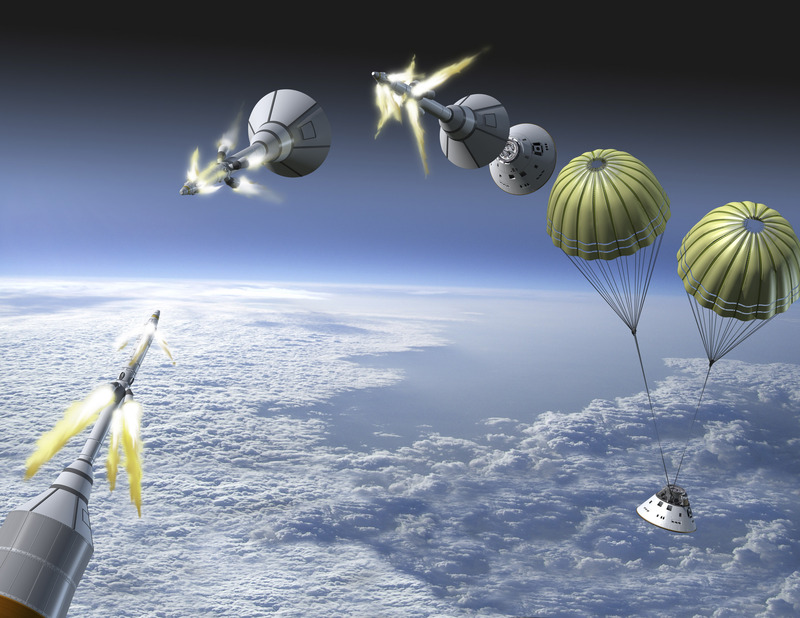 These simulation and visualization techniques, which were conducted with the Pleiades supercomputer at the NASA Ames Research Center, predict how vibrations will affect the Orion spacecraft’s launch abort vehicle during takeoff. Previously, the use of such high-fidelity tools has been largely restricted to academic research, and not something private industry contractors could take advantage of. Together with Michael Barad – an aerospace engineer at the Ames Research Center – Cadieux produced a variety of turbulence-resolving computational fluid dynamics (CFD) simulations using the NAS-developed Launch Ascent and Vehicle Aerodynamics (LAVA) software. The video below shows the simulation of an ascent abort scenario, where the LAS has detached from the SLS and is traveling at close to the speed of sound. The abort process initiates with the ignition of the LAS motor and then slows down as the pressure and airflow conditions become particularly harsh. The colored plumes indicate high pressure (red) and low pressure (blue), with pixels changing from blue to red (and vice versa) in relation to pressure waves that cause vibrations on the vehicle (white). The regions where the color changes abruptly, but remains generally blue or red over time, indicates the presence of shock waves. In the end, these simulations are directly impacting the spacecraft’s design and will help ensure astronaut safety and spacecraft performance. The answers to these questions will will be used to design the next series of ground tests, crew mockup tests, and critical flight tests, which will will prepare the Orion spacecraft for its first crewed mission – Exploration Mission 2 (EM-2). This mission, which is scheduled for launch by 2023, will consist of four crew members conducting a lunar flyby and delivering the first components for the Deep Space Gateway.